The other side of holos: F.U.N. Lacquer Starry Night of the Summer | Light Your Nails! After yet another busy week-end where I had zero time for the blog I am back again to team with Cristina at PeeBeforePolish for our weekly twin post. Today’s polish for both of us is F.U.N. Lacquer Starry Night of the Summer, which was a 2014 release by this Singaporean indie brand. 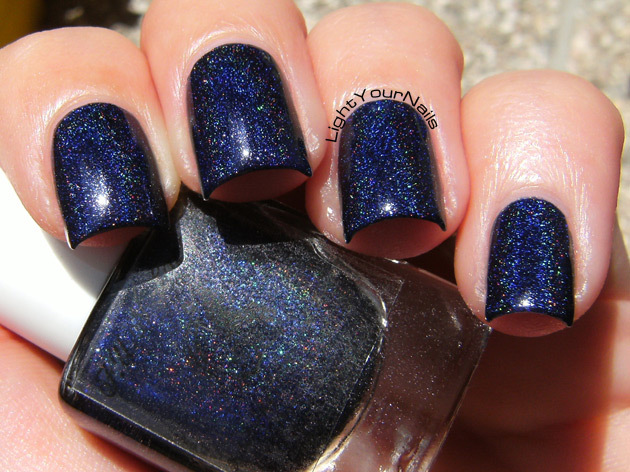 It’s a gorgeous navy blue with a strong linear holographic effect. Unfortunately the formula wasn’t as good as the colour and holo sparkle. This polish is extremely dense and it was really hard to paint it on my nails. I added a mixing ball to it but I probably should have added some thinner, too. Un altro fine settimana con zero tempo da dedicare al blog è andato, e oggi si torna con Cristina del blog PeeBeforePolish per il nostro appuntamento del lunedì. Lo smalto che entrambe vi mostriamo oggi è F.U.N. Lacquer Starry Night of the Summer, un’edizione limitata dell’estate 2014 di questo brand indie di Singapore. E’ un bellissimo blu navy con un forte effetto olografico lineare. Purtroppo però la formulazione non è al pari della sua bellezza. Questo smalto è molto denso ed è stata una fatica stenderlo sulle unghie. Avrei forse dovuto aggiungere del diluente, ma onestamente ci ho pensato tardi. This was my first experience with F.U.N. Lacquer but I’ve heard it’s not that unusual for its polishes to be thick and dense, and I must say I don’t like it. Formula was a big let down for me and despite the beautiful colour and effect I just couldn’t forget how hard it was to paint. All in all not a keeper for me. What’s your thought about beautiful polishes with crappy formulas? Have you ever tried any F.U.N. Lacquer nail polishes? Let’s see what Cristina has to say about it, too! Questa era la mia prima esperienza con uno smalto F.U.N. Lacquer ma da quel che ho letto in giro non è così strano che i suoi smalti siano così densi, cosa che a me non piace affatto. La formulazione mi ha lasciato proprio delusa e per quanto lo smalto possa essere bello non posso faticare così per stenderlo. In generale non lo consiglierei. Voi cosa ne pensate di uno smalto bellissimo ma che è un incubo da stendere? Avete mai provato degli smalti F.U.N. Lacquer? Vediamo cosa ne pensa anche Cristina! Lo trovo assolutamente stupendo come colore, certo così tanta difficoltà per stenderlo non so se ne vale la pena. Dai che l'effetto holo l'hai beccato, specialmente nell'ultima foto - lo so, lo so, IRL è tutta un'altra roba! Ahah, non fa una piega! Wow, it looks gorgeous! But I hate bad formulas. Sicuramente! Colpa mia a non averci pensato subito! This is such a gorgeous shade, a real shame about the formula though. If the formula is off, it really puts me off using it! E' quello che succederà infatti! Ehhh capisco benissimo la questione formula! Questi qui negli ultimi tempi necessitano sempre più di diluente... all'inizio non erano così! Il colore è stupendo e ci ho fatto più di un pensierino! Speravo proprio di avere la tua opinione, perchè so che ne hai più d'uno della marca! Hmm, se non erro ho anche quello (il Mowed coso). Assolutamente possibile! Avrei dovuto pensarci subito al thinner, assieme alla palletta! Non mi pare che i primi che avevo provato fossero tanto difficoltosi...Ma erano proprio i primi, quasi un paio di anni fa! It's a shame about the formula because this is so pretty. Hopefully some thinner will help. You are right... This is a gorgeous polish! I love the way it sparkles! This polish is gorgeous!! That's such a shame that the formula is difficult! Such a bummer you didn't like the formula! I must admit I have tried quite a few from this brand and while I do find them to be thicker and very opaque, I never experienced any troublesome application. While I don't think it should be necessary, have you tried thinning it a bit? Gorgeous Blue, I don't like Blue shade usually, but this one makes me wanna have it. You don't like blue? Oh wow! Such a gorgeous shade. Love it.